$30 (dinner & concert included) at the door only. 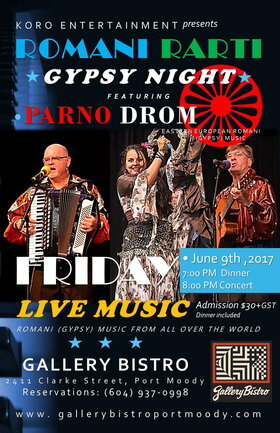 Romani Rarti ( Gypsy Night ) at the Gallery Bistro, 2411 Clarke Street, Port Moody, BC. Romani (Gypsy) music from all over the world. Gallery Bistro - where friends, food, art and music come together. Dinner Concerts, jazz jam sessions, workshops and gallery art shows are making this popular lunch spot into much more. If you have food allergies or difficult dietary restrictions, please let us know at the time of making your reservation.